Introduction. Join Forces with a Psychiatrist to Open a Risk-Free Private Practice. Don't Become Married to a Single Referral Source. Accept the Fact That Salaries in this Field Are Often Unfair. It Pays to Be Assertive When You're Shopping for Your Salary. Managed Care Panels Often Slam the Door in Your Face. Managed Care Firms Dictate Who, When and How. The Multicultural Diversity Secret: You Can Work with a Wider Range of People than You Think. Never Give Any Client Information without a Signed Release-of-Information Form. You Must Use a DSM or ICD Diagnosis to Secure Third-party Payments. The Insurance Superbill Must Have Your Name as the Provider. Lecturing May Not Flood Your Waiting Room with Clients. Referrals Received Do Not Determine How Many New Clients You Actually See. Managed Care Companies Discriminate against Some Counseling and Psychotherapy Theories. Refer Severely Depressed Clients for a Medical or Psychiatric Evaluation. Find Out if the Psychological and Psycho-Educational Test Reports You Receive Are Individualized. Don't Be Mislead by Clients Who Initially Put You on a Pedestal. Most Professional Certifications Won't Help You Secure Insurance Payments. 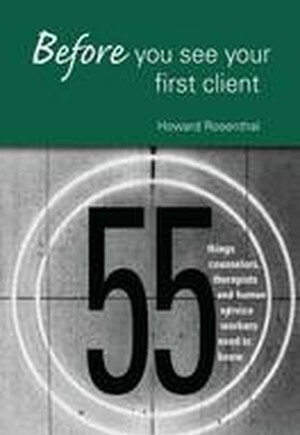 Don't Use Paradoxical Interventions with Suicidal and Homicidal Clients. Conduct a Suicide Assessment on Each Initial Client. Don't Try to Clone Your Favorite Therapist. When in Doubt, Use a Person-Centered Response. Read Ethical Guidelines Before You Even So Much as Hug a Client. Don't Rush to Therapeutic Judgment Until You Get All the Facts. The Number One Therapeutic Blunder: Confronting Sooner than Later. You Are Not a Failure if You Don't Land Your Dream Job. Your Supervisor's Knowledge and Experience Should Not Be Underestimated. Use Verbiage Your Client Will Understand. Be a Better Helper by Networking with Others in the Field. Grandfathering: The Fast Track for Snaring Licenses and Certifications. Use Free Advertising to Build Your Agency or Practice. Helpers are Mandated Child-Abuse Reporters. Beyond Confidentiality: Professional Counselors and Therapists Have a Duty to Warn. If You Want to Work in a Public School, Contact the Department of Education. Don't Let a Day from Hell in Court Lower Your Professional Self-Esteem. Save Your Course Catalogs to Invest in Your Future. Enhance Sessions by Adjusting Group Treatment Exercises and Using Small Talk. If a Client Was Disappointed with the Previous Helper Find Out Why. Use Caution When Considering the "In" Diagnosis. Don't Go into This Field to Recount Old War Stories about Your Own Recovery. Don't Become Married to a Single System of Psychotherapy. Be Enthusiastic if You Want to Be a Better Workshop Presenter. Don't Try to Clone Your Favorite Mental Health Lecturer. If a Client You Have Been Seeing for an Extended Period of Time Requests Marriage, Family or Couples Therapy, Consider a Referral to Another Therapist. Be Prepared to Change Therapeutic Strategies at a Moment's Notice. Documentation: The Royal Road to Promotion. Avoid Dual Relationships Like the Plague. Insider Tips for a Good Cover Letter and Human Service Resume. If You Are Daydreaming, Your Client Will Perceive You as an Uninterested Helper. Pick a Theory of Intervention and a Job You Believe In. Despite the Pitfalls, Make Friends with the Media to Promote Yourself and Your Agency. Writing a Book or Starting a Project? Ask Your Agency First. Your Employment and Credentials Determine What You Pay for Malpractice Insurance. Private Practice is Not a Panacea for Everything that Ails You. Steer Clear of False Memory Syndrome. Create an Emotional Trophy Closet to Help You Through a Bad Day. Conclusion.